11 days or 3500+ kms; chill of minus 6 degree of last day or now 36 degree of today; wonderland of Zanskar or hiddenland of Changthang; a big convoy of 8 self drive cars, 3 taxis and 3 bikes or you call 50 odd free souls in heaven; loads of uncertainties or hundreds of emotions; days full of colors or days full of adventures; sleeping with 20 odd devils in one room on floor or stranded with two tyre bursts in a land higher than khardung la; spreading the smiles in zanskar or spreading the smiles in changthang; some billion stars studded night or some breathless nights of low oxygen; an emotional moment at kargil war memorial or a not so happy services of zanskar stay; scaling the mighty Kaksang la with 13 high mountain passes or witnessing the serene beauty of 10 lakes; magnanimous hospitality by locals of Ladakh or amazing bonding/understanding among all devils; we call them roads or we call them only off roads; stranded in the middle of nowhere with numb hands or sleeping in warm hospitality of locals of Hanle; smiles on the faces of all devils everyday or sadness of separation on the last day; and much more to it…. This is what DoW Mega Meet 2015 was felt like by all devils who joined from various parts of our beautiful country!!! Thank you from the bottom of my heart to all the devils to come along and join this arduous journey in remote parts of trans Himalayas to participate in DoW Causes and do what we, Devils, do best – Spreading Smiles in Himalayas… Yet another ever memorable journey with you all comes to an emotional end but only to begin preparations for the DoW Mega Meet 2016…. 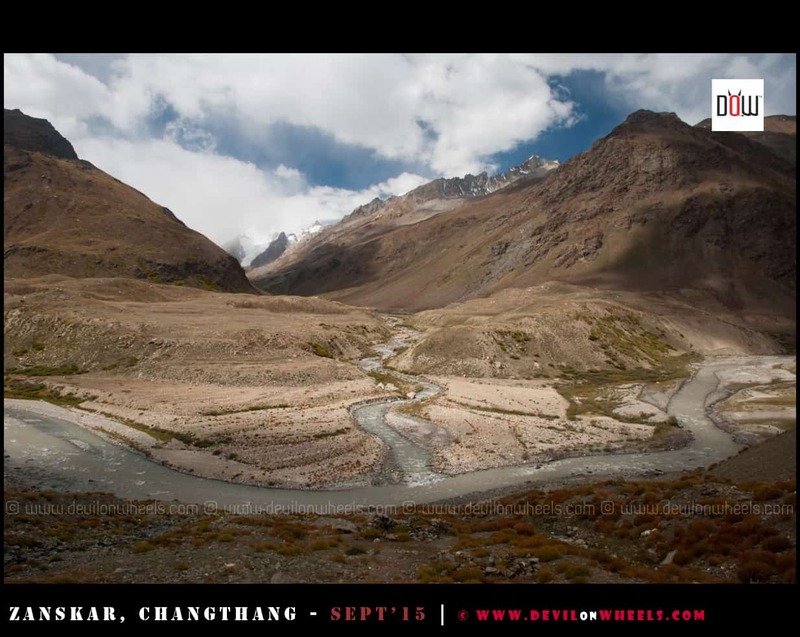 As I kick start this epic travel tale of Zanskar Valley & Changthang region of Ladakh, in this article I will just brief out the plan we followed, the road conditions over that route and the expenses that incurred in general to most of us. 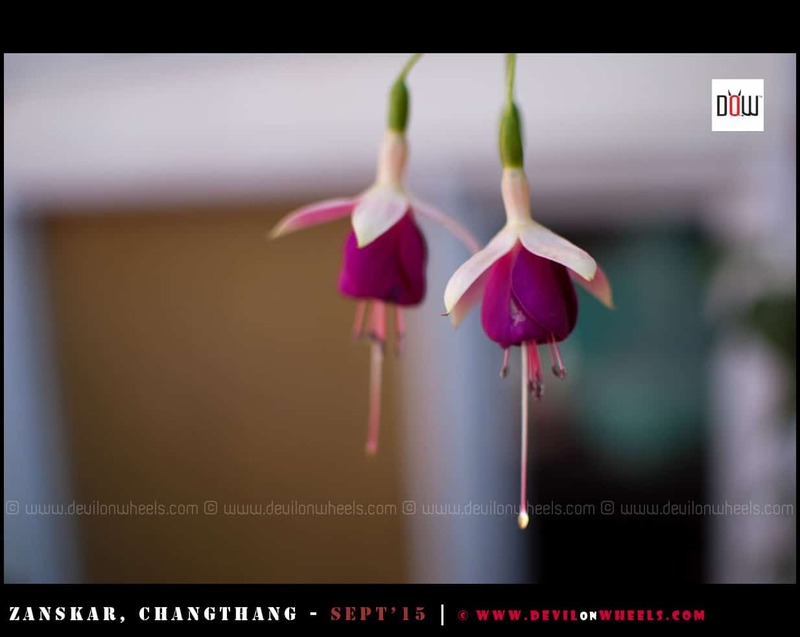 Day 1: We took a flight to Srinagar and kicked off the mega meet 2015 there. 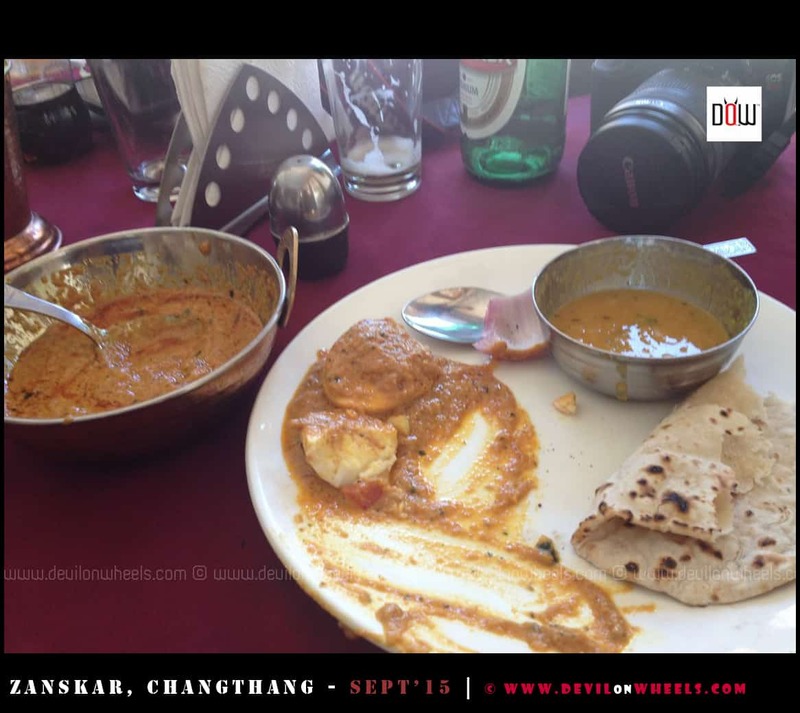 We had our lunch at Drass and stayed overnight at Hotel Greenland in Kargil. We reached Kargil around 6.30 PM and started from Srinagar at 9.45 AM. Day 2: Started early morning at 7.20 AM and struggled our way on bad roads all the way to Padum crossing through Rangdum – Penzi La to reach around 6.30 PM. We stayed at Hotel Marq which was comfortable in stay though in terms of services offered and other Hotel Ibex (rooms full of spiders) dented the spirits of many of us right at the start of the trip. Day 3: Stayed in Padum and explore Karsha monastery and Stongde monastery in Padum, we went to Sheela village to see the waterfall and executed DoW Causes in the village to spread some smiles. Day 4: After seeing the harshness of Rangdum on the way, many of us decided to skip the stay there and rightway go to Kargil. However, even rest of us were forced to reach Kargil due to disputes in taxi unions of Leh and Kargil so that we could communicate our pickup from Kargil in better way. We did DoW Causes in the school behind Rangdum monastery and believe me that smiles around in each class were just priceless !! This time we stayed at Hotel Siachen in Kargil as Greenland was full. We left Padum at 8 AM and reached Kargil by 6.15 PM. Day 5: We ran over NH1 to Leh from Kargil covering Lamayuru moonland, pathar sahib, magnetic hill, basgo ruins to reach Leh at night around 8.30 PM. We stayed at Hotel K2 this time in Leh and I was lucky to receive the hospitable dinner from one of the driver Chamba at his lovely home. He was not with us on the trip as Ringzin was with us but he has took my promise to have dinner at his home well in advance. I never ate such nice momos and sweet corn soup before, may be the warmth of his family and their hospitality turned it into special. 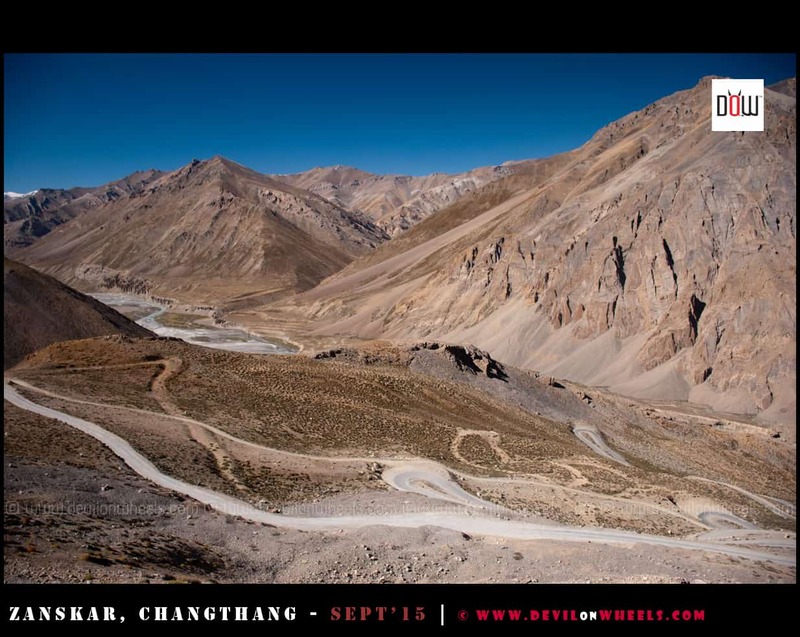 Day 6: We started at 9 AM from Leh for Hanle going through Chumathang. It almost was 10 AM as we quitted Leh with many issues running around. We reached Hanle at 6 PM and stayed overnight at Padma Homestay. 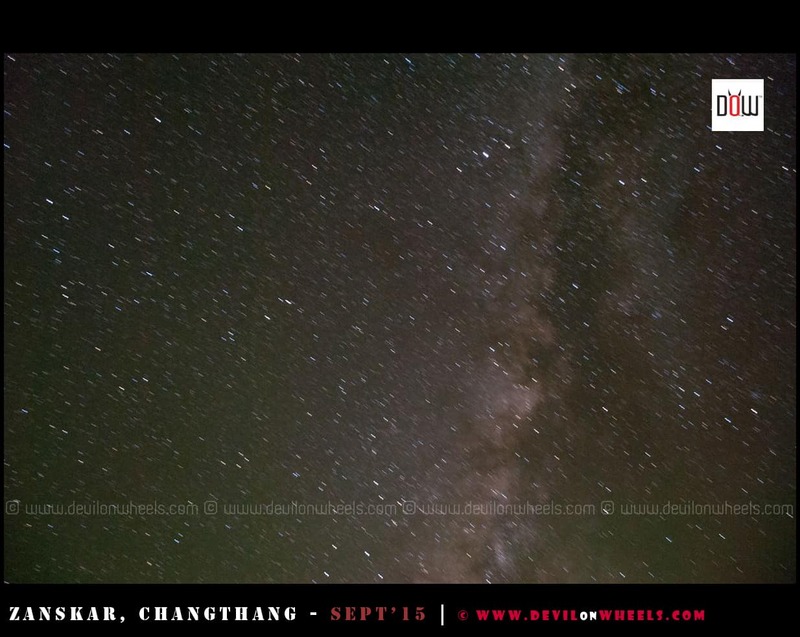 Day 10: By evening we got back home from Mandi by taking the route from Jahu – Bhota – Una. 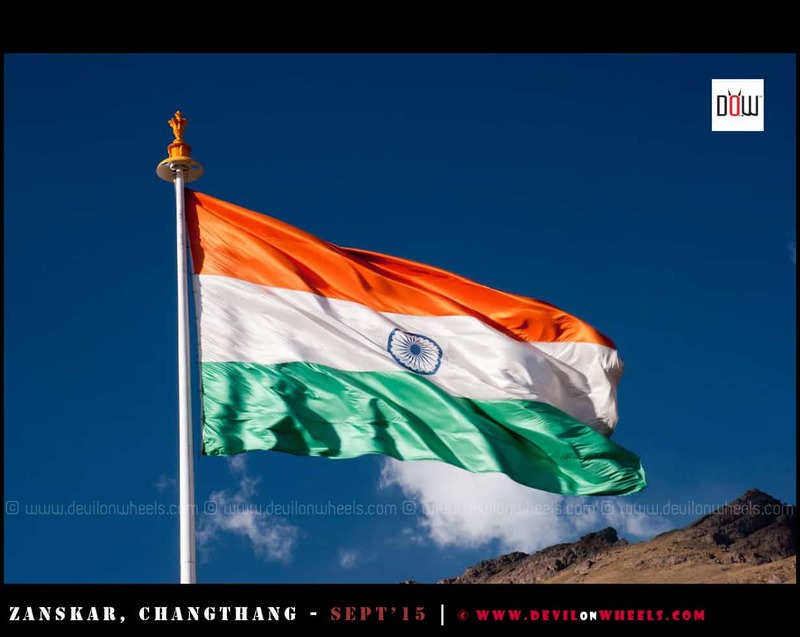 Srinagar – Sonamarg – Zojila Pass – Drass – Kargil: Most places it is good. But a little bumpy and dusty roads near Zojila Pass. Rest barring few patches of bad roads, all is quite good. Kargil – Sankoo – Purikutchey: Quite excellent roads all the and you can easily maintain a speed of about 50-55 KMPH for this 60 odd KMs stretch. Purikutchey – Parkachik: Average roads but seems OK.
Parkachik – Rangdum: Some quite very bad sections and tricky especially for small cars which will take some beating. Kargil – Mulbekh – Lamayuru – Khaltsi – Nimmu – Leh: Apart from the road between Mulbekh and Kargil where maintenance work is going on, the road was excellent in condition all the way to Leh. 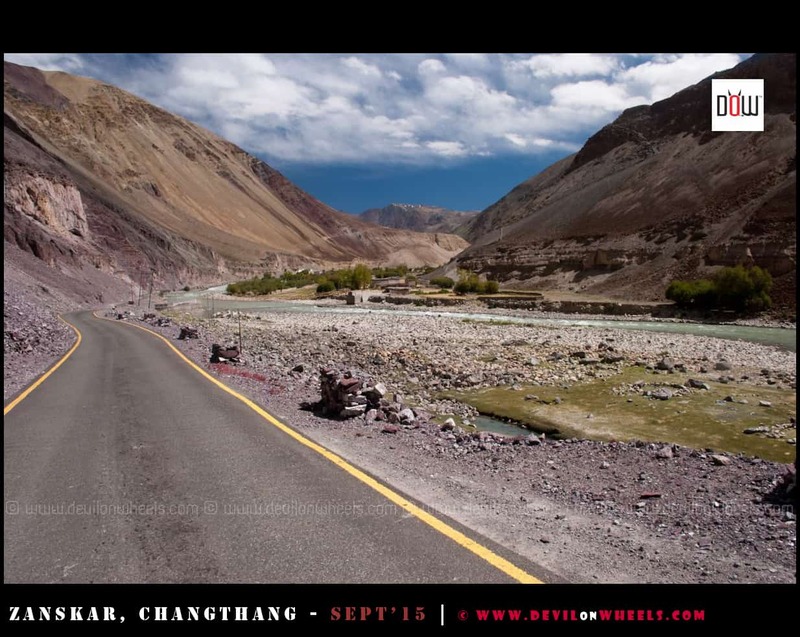 Leh – Chumathang: Mix of good and average roads but nothing a small call will struggle or have issues. Road work going on and even small cars can do it at ease. 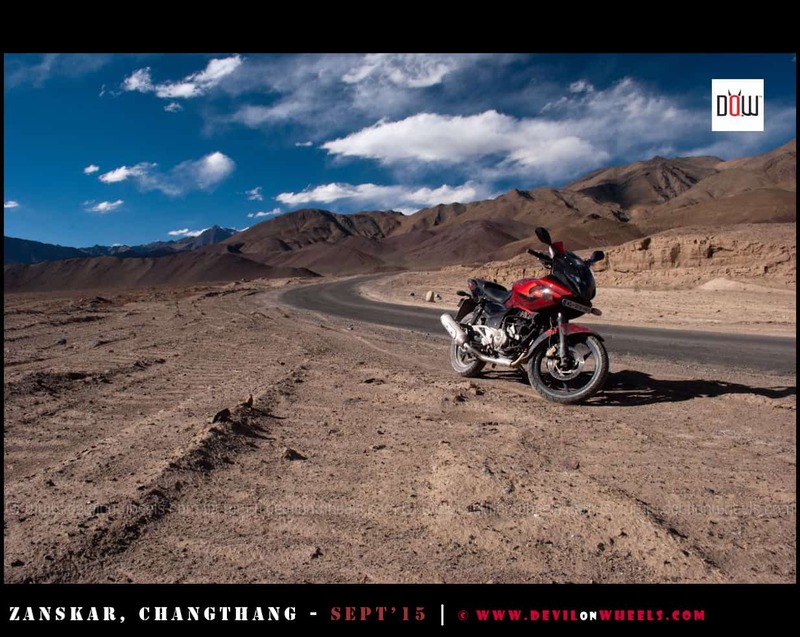 Chumathang – Mahe – Loma – Hanle: Well tarred roads, mostly excellent. 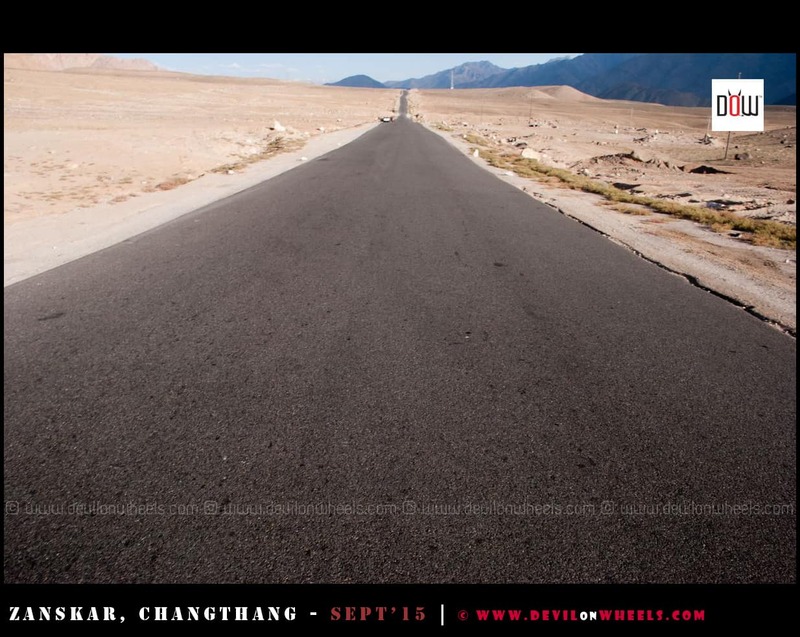 Mahe – Sumdo – Namashang La – Kiagar Tso – Tso Moriri: Mix of good and average roads. Some sections are metalled but some have potholes. The road just before Tso Moriri of about 15 odd KMs is remaining to be tarred but rest has been tarred well beyond the first views of the Tso Moriri lake. 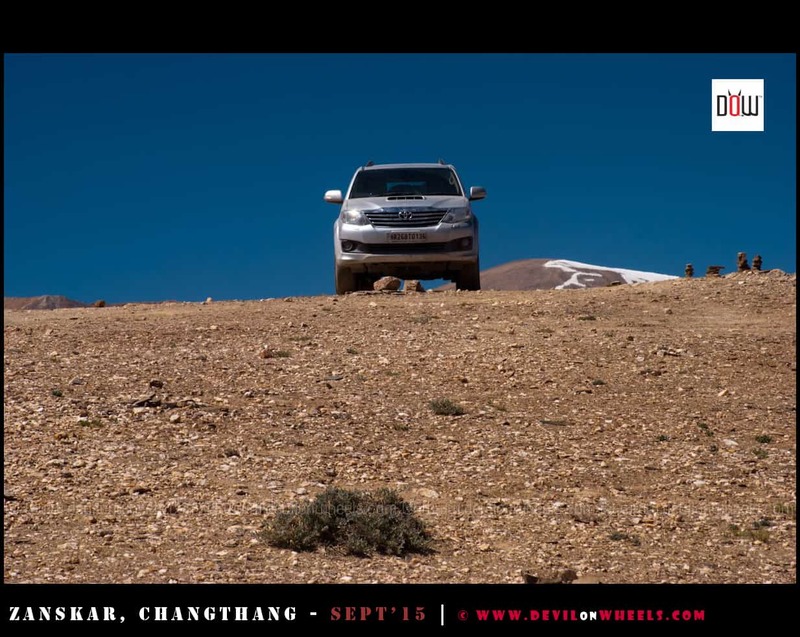 Kiagar Tso – Tso Moriri: Bad road like a dirt track but manageable with hatchback as well as sedans. 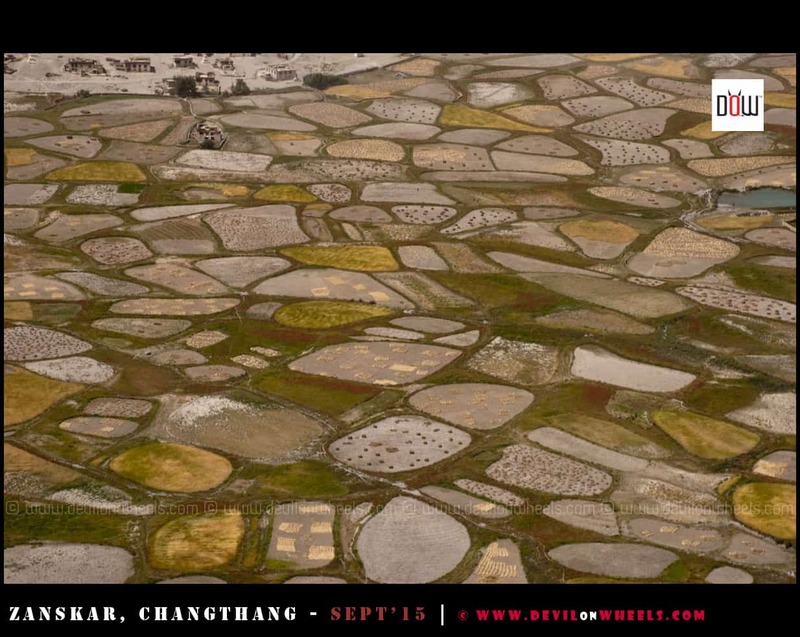 Sumdo – Polokong La – Tso Kar Lake: Average roads with mix of tarred but not so good and maintained. Rest of the sections were like dirt track. Tso Kar – Debring – Moore Plains – Pang: Good, tarred roads all the way. You can clock 80-100 KMPH on Moore Plains. Pang – Lachulung La – Nakee La – Gata Loops – Sarchu: Mostly average roads and in SUV feels OK. Small cars, there were some tricky sections. 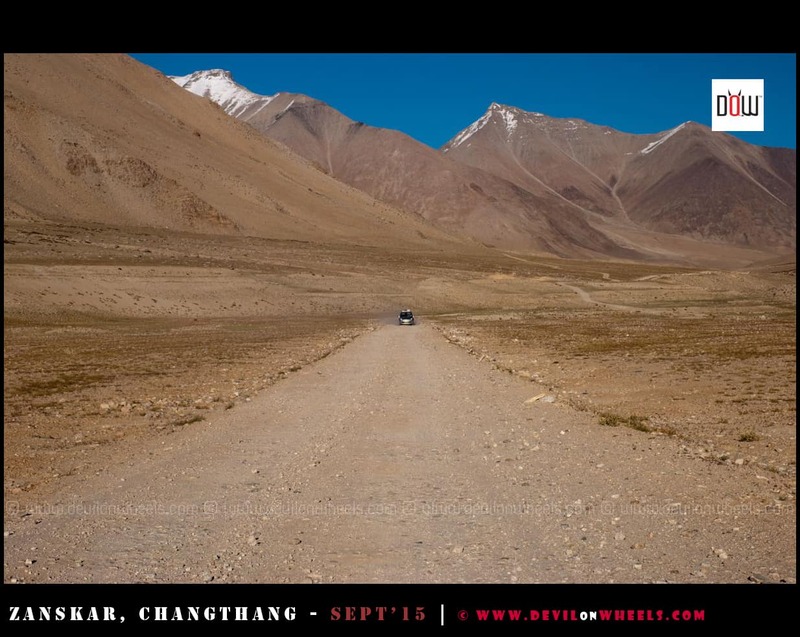 Sarchu – Baralacha La – Darcha: Quite bad and bumpy roads all the way Baralacha La top. Small cars will take a good beating. 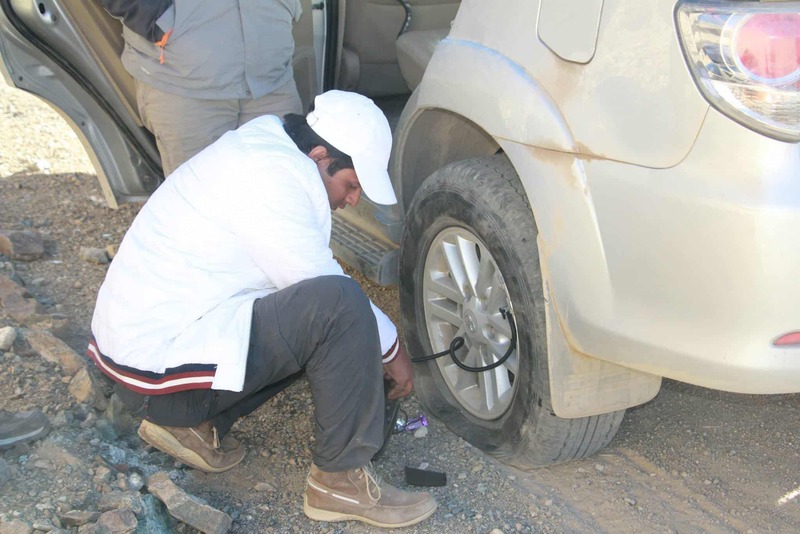 Baralacha La – Zingzing bar – Darcha: Mostly well tarred, excellent roads all the way to Darcha except few sections in between. Darcha – Jispa – Keylong – Sissu – Khoksar – Gramphu: Good, tarred roads barring many sections only between Tandi to Sissu especially which are in quite bad in shape. 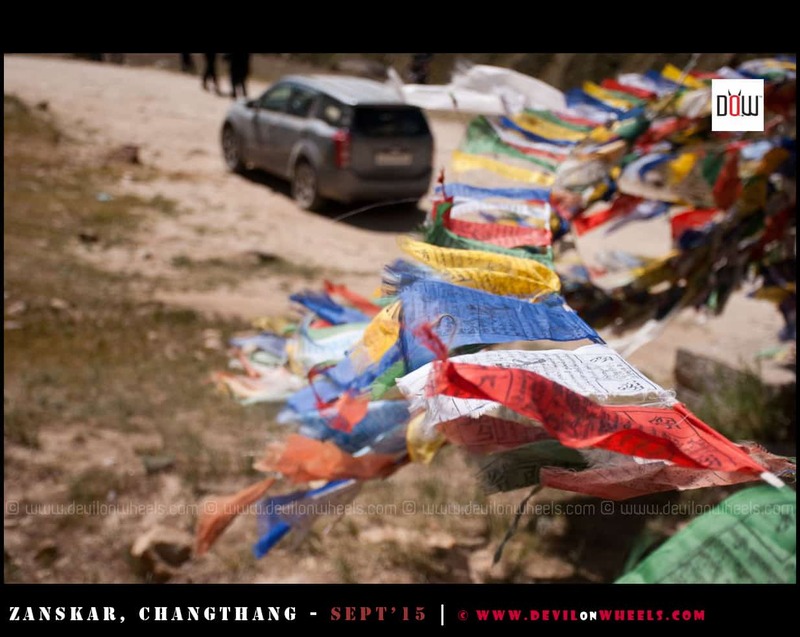 Gramphu – Rohtang Pass: Bad and bumpy mostly. Since last year, it has deteriorated a lot. Small cars will take a good beating. 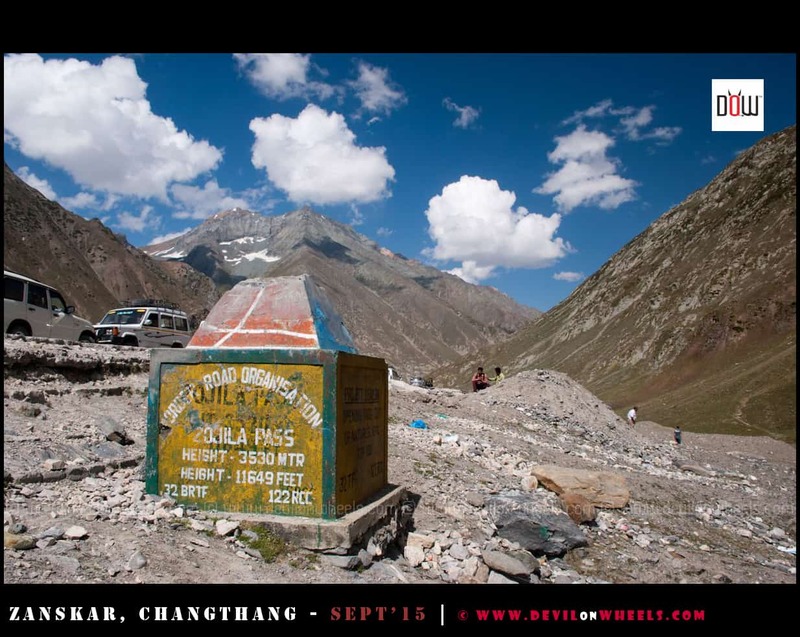 Rohtang Pass – Manali: Mostly good with just about a KM near Rani Nalla being average. Rest all tarred even the Rohtang Pass top up to Manali. Manali – Mandi – Ner Chowk – Jahu – Bhota – Una – Ambala – Delhi: Except the first 15-16 KMs of narrow road to Jahu bridge from Ner Chowk and about a 200-300 Mtrs of a bad patch where road work is going on, excellent roads all the way to Delhi. This is a longer route but saves you from trouble of trucks mess-up bad roads of Manali – Chandigarh Highway from Sundernagar to Bilaspur to Swarghat to Kiratpur. The overall taxi cost of the trip including Srinagar to Kargil, Kargil to Zanskar and back and then a drop to Manali covering remote corners of Ladakh came out to be Rs 85000. Those who were in taxi had a share of about Rs 17000 each. So, taxi guys did the trip in around Rs 26300 with extra air tickets to Srinagar from Delhi. They did not spend the last day as they took overnight Volvo to reach back home on the same day. This is interesting trip, i can feel that it is great place to have fun with peace and culture. Thanks for sharing. Thanks & congrats for your excellent work in helping enthusiasts plan fantastic trips. 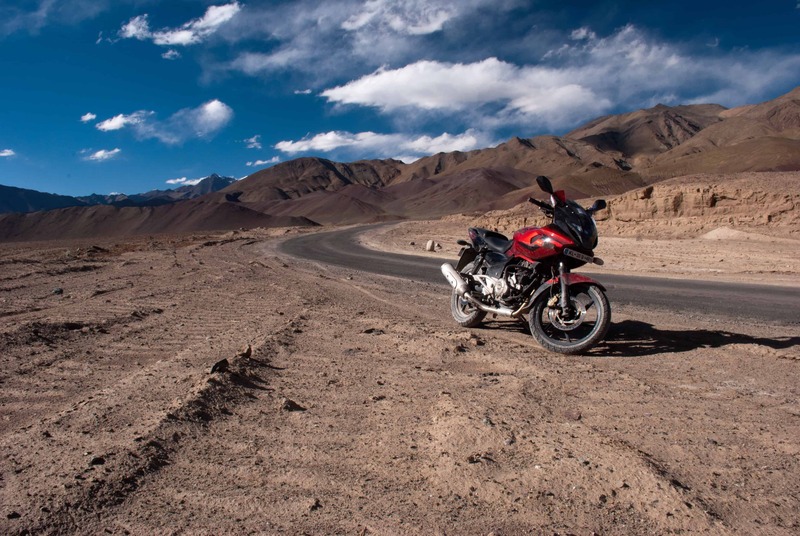 Can you please suggest if it is possible to pick a bike from Leh and drop at Manali ( if yes, then can you please share no.s). Sunil, that kind of arrangement of one way bike travel on rented bike will have a big dent in your pocket. They charge about 10-12K just for the pickup from Manali. If you can afford it, you can do it. 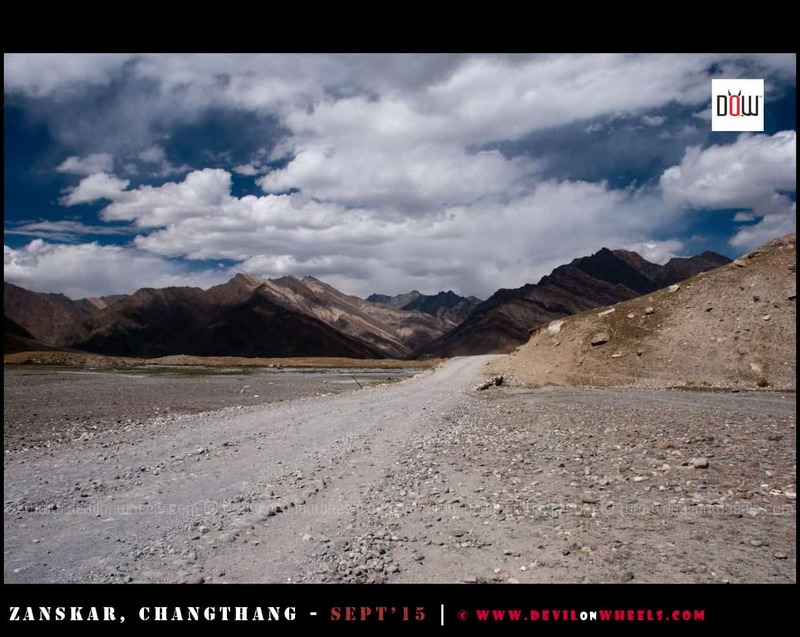 How are the road conditions to Zanskar. And whats your advice on this: is it safe to travel this route (via Kargil) since there are disturbances going on in Srinagar and URI attack has happened. It will be OK to visit PAdum in first week of October and roads will be dry and better shape as compared to whole season. However, it will be quite cold up there and dry. So, take utmost care and only venture after checking weather conditions at Kargil because snowfall can close Penzi La pass for few days. Area around Kargil is not affected from disturbance in Srinagar, as per updates shared by many. Observation: After reading the itinerary and related blogs as listed above, , i didn’t find any mention of your travel slated for Day 5,6, 7. Query 1: Have i missed out the blogs describing days 5,6,7? If yes pl share me with the link..
Query 2: In case you dropped your plans of those days and hence there are no blogs describing them? Query 3: Is it that these places can’t be travelled in Sept and you dropped them from your itinerary, based on review on reading Padum.. Sorry if the queries are repetitive or if i have missed or misunderstood the travel. 1. 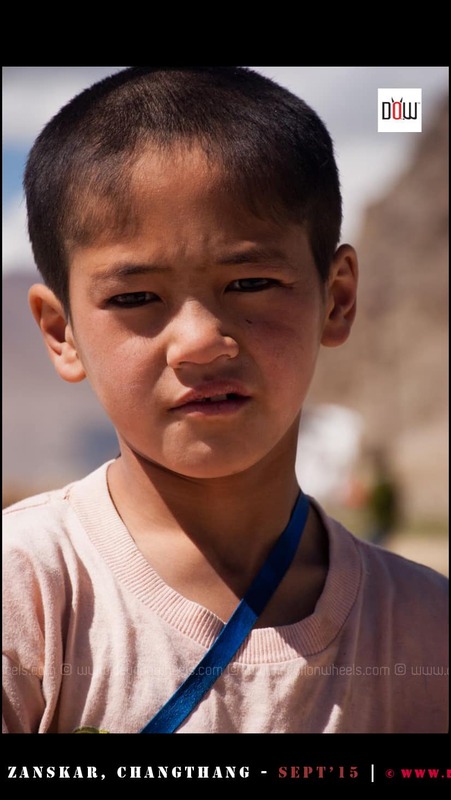 Since there was an unrest in Zanskar during that time and clashes were going on in the local communities, we had to flee in odd wee hours of the day dropping most of the planned things. Thanks for your prompt response and sharing the information. Understood why there was a gap. Happy to note you could return safe..
Query: Isn’t Zanskar as peaceful like Ladhak? Query: Is it good and safe to travel with family and kids to Zanskar? 1. It is peaceful but I was caught in wrong time in wrong circumstances. 2. Yes, not it was all peaceful when we went up there in 2015. 3. Yes, it is quite safe to travel, the people up there are in general very helpful and accommodating. I am Kuntal. Stay in Noida. 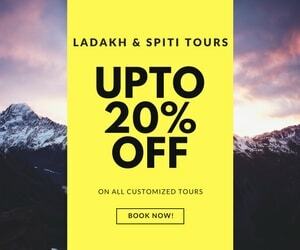 Did visit Ladhak in 2015 and took lot of tips from your blog. 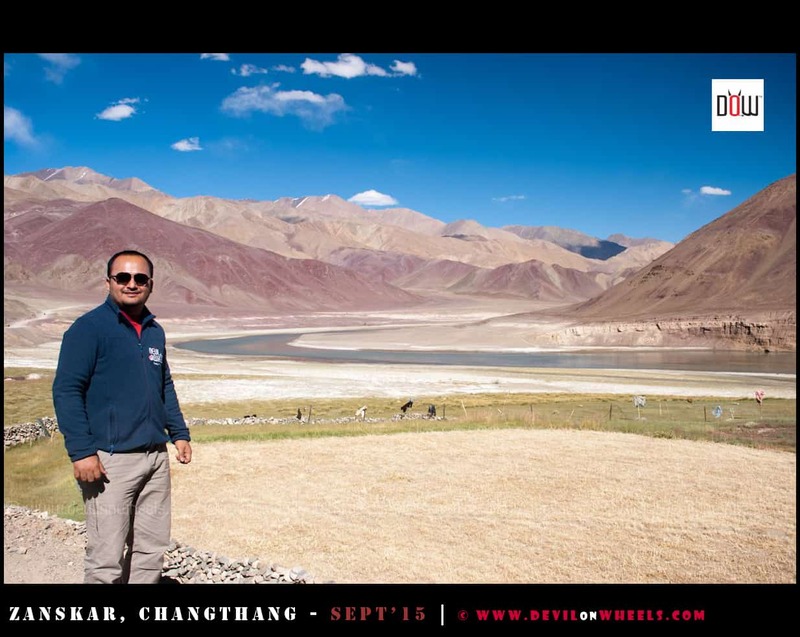 We had the opportunity of travelling in Ladhak with RIGZIN, thanks to his contact at your blog. 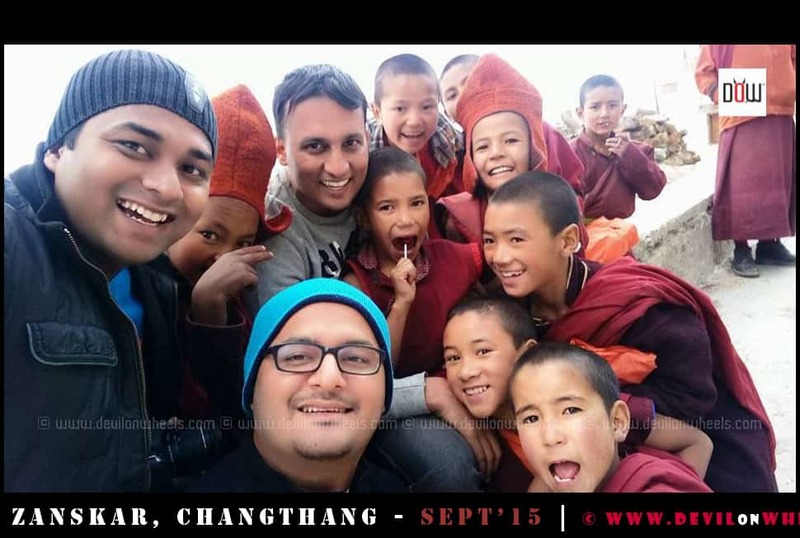 Do you know someone like RIGZIN for Zanskar travel? Do you have contact no pl? I presume we have to hire cabs from Kargil for Zanskar. 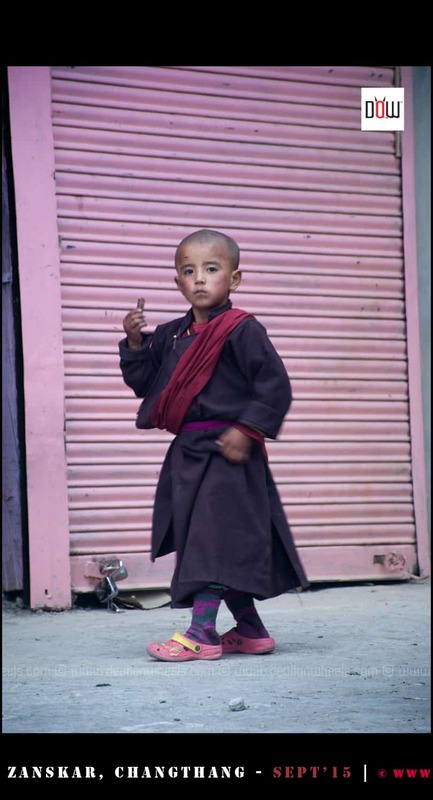 How many days we need at Zanskar and what all to visit? Where to stay? Do have contact numbers pl? I am planning during End Sept, is that a good time? Sorry to have troubled you with these. Could you pl share names and contact numbers of some cab drivers for Zanskar travel? Thanks for your response and drawing my attention on the link.. I found names of few drivers on Kargil Zanskar route..would you recommend any other them? Just to rephrase my query.. I need to hire a cab from Srinagar to Kargil. Leave that cab at Kargil. Hire another cab from Kargil to Zanskar..say it would take me to Padum and back to Kargil. Padum local travel would be by local cab..
Is that how you advice to plan logistics? Thanks in advance for reconfirmation. Kuntal, I updated the list with drivers below as they were with us on DoW Mega Meet 2015. All of them were very very nice chaps especially Jaan and Abbas. [*]Ansari: 094-69-568527 Nice chap, very helpful and was with devils on DoW Mega Meet 2015 in first taxi. No complaints by anyone in the group. [*]Jaan: 094-69-732955 Nice chap, very helpful and was with devils on DoW Mega Meet 2015 in second taxi. No complaints by anyone in the group. [*]Mohd. Abbas: 094-69-249211 Nice chap, very helpful and was with devils on DoW Mega Meet 2015 in third taxi. No complaints by anyone in the group. 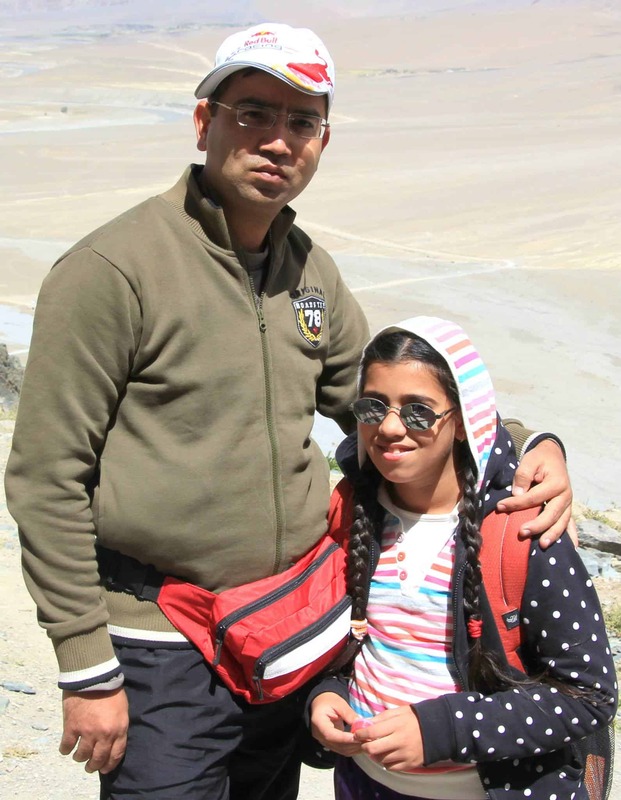 They can help you with Kargil to Zanskar route for sure and I see no reason they cant help you with Srinagar – Leh. 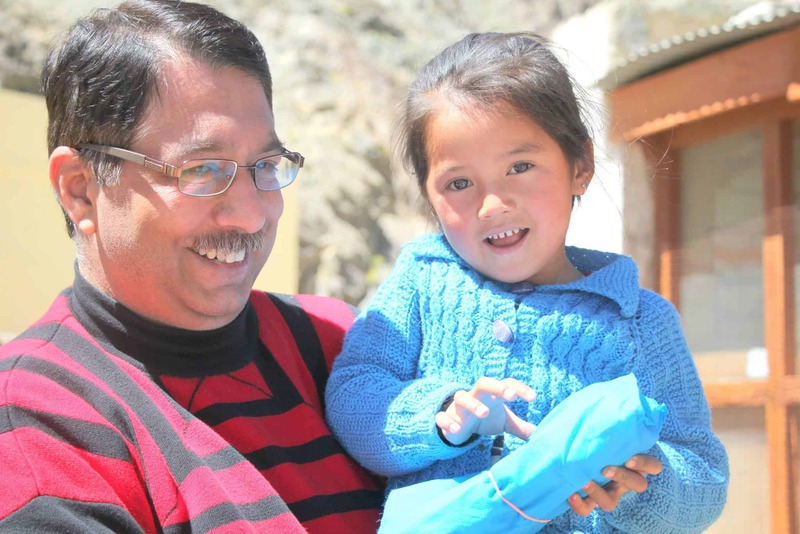 Else for Srinagar – Leh, you can contact Firoz or Kazim. Padum to Kaargil, they will make special arrangements where in they will ask local guys to drop you after 3-4 villages outside Padum and then you will be continue in their car. Else if you go by unions then only Padum taxi can drop you to Kargil. 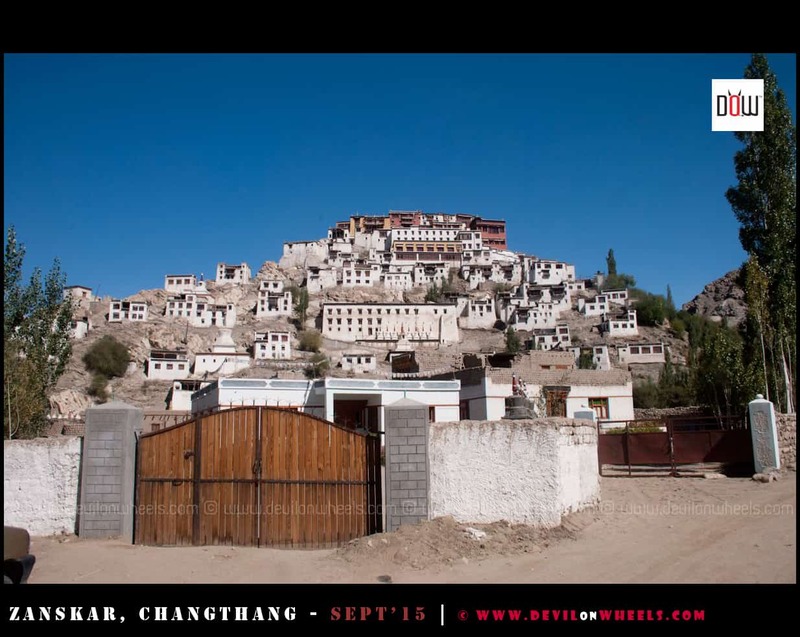 Have not you travel deep inside of Zanskar Valley such as Phugtaal monastry and Drang -drung glacier this time ? No Debasis, we could not go to Phuktal as due to floods there has been impact over there. We did Drang Drung as it falls right on the road. how can i join your group for next trip ? Hello Mr. Ravinder, nothing much is needed to join our group….just stay connected with us over the community and you’d know it all. 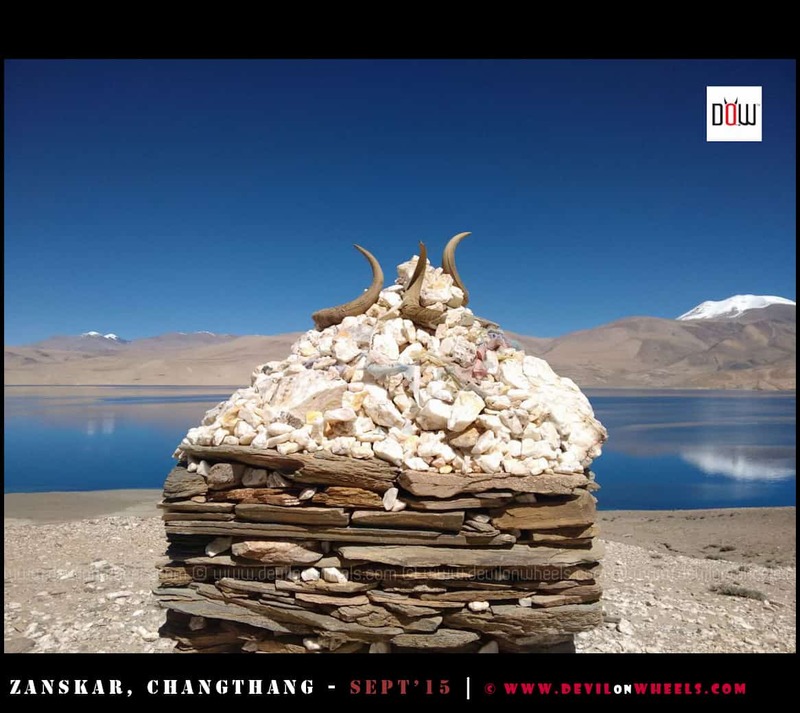 Saying that, we appreciate travellers with an inclination towards responsible travelling and do whatever possible in one’s capacity towards the betterment of the lives in the Himalayas. 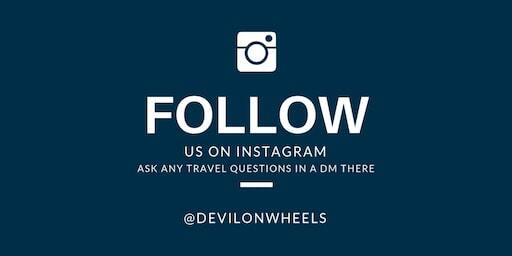 Ravinder, Regarding being member or joining DoW, there is no specific criteria we define except: If you are aligned with DoW Vision and DoW Causes and of course you like the spirit of Adventure plus love Himalayas and travel up there, you can be an active member of the DoW community and participate at the link https://devilonwheels.com/india/ … It can be accessed over mobile app of all platforms too, on the move or while traveling, details of which you can see in the announcement section of the community in above link. Please register there and start participating. 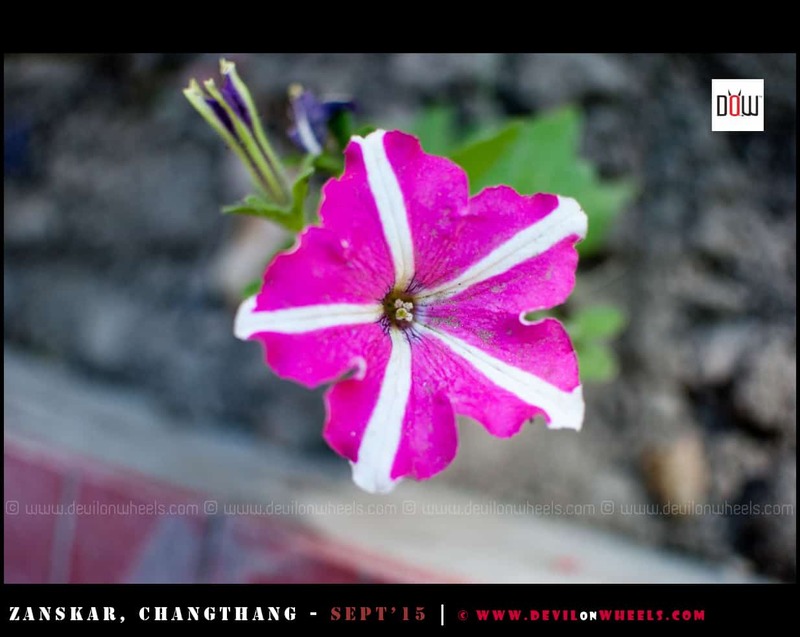 Join us over Delhi Mini Meets if you around here, next is going to happen in mid October, check events section on FB Page. Once a year we call a mega meet where we all travel to Himalayas together in a large group and execute various DoW Causes to spread smiles up there in Himalayas.